Abandoning his horse, Charles urges it to gallop on riderless, in the hope of tricking his pursuers — and giving him time to escape unnoticed. As Charles plunges down the hillside, his horse immediately slows. Sanders and Jim spot the deception, and dismount. Description: This hill top track is immediately behind Air Cottage — the real-life location of 'Fenton's halfway house'. Where's the best vantage point? : The camera is position on the track, looking back in the direction of Air Cottage. 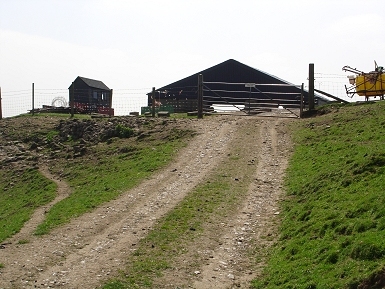 The roof of one of the farm's barns is visible, on the left of the picture. Anything else? : Once again, the episode's director Tristan de Vere Cole cuts together different locations for dramatic effect. 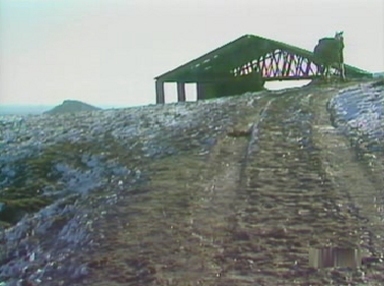 Moments earlier, Charles is shot at as he rides away from Air Cottage. This location is found behind the house — so, in reality, Dennis Lill has been riding back towards Air Cottage from the other side. The locations that Lill reaches on foot at the bottom of the ravine moments later are, in fact, back at in the Monsal valley, many miles to the north. The very limited parking at Air Cottage is private, and prior permission should be sought before making use of it. Alternatively, park in Ilam and approach the area on foot. The walk from the centre of Ilam is a fairly steep 30-40 minute climb - either by following the road uphill or (for those comfortable using OS maps) taking one of the footpaths up over the fields.. The walk from the centre of Ilam is a fairly steep 30-40 minute climb - either by following the road uphill or (for those comfortable using OS maps) taking one of the footpaths up over the fields.